Van Diemen Island. Western Australia Containing the Settlements of Swan River and King George's Sound from Surveys sent to the Colonial Office. This is the c. 1849 Edward Stanford edition of the Society for the Diffusion of Useful Knowledge's historic map of Western Australia and Tasmania or Van Diemen's Land. Essentially two maps on one sheet. The leftmost map details western Australia from Melbourne south around Sussex to Stirling and Plantagenet. Notes numerous counties, roadways, geographical features, and more. 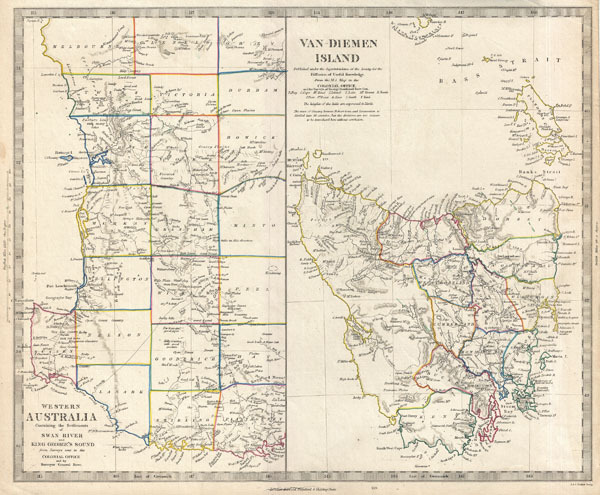 The right hand map is a large detail of Van Diemen's Island or Tasmania. This map offers a significant update from previous editions in the addition of county detail to the Island. Names twelve counties as well as numerous geographical features, roadways, cities, and towns. Published by Edward Stanford of 6 Sharing Cross for the c. 1849 edition of the Maps of the S.D.U.K. atlas. Maps of the Society for the Diffusion of Useful Knowledge. Vol. 1. London: Edward Stanford, 6 Sharing Cross, 1849. Rumsey 0890.157. Tooley, R.V., The mapping of Australia and Antarctica, 2 nd. ed., p. 147, no. 1176 and p. 343, no. 391.